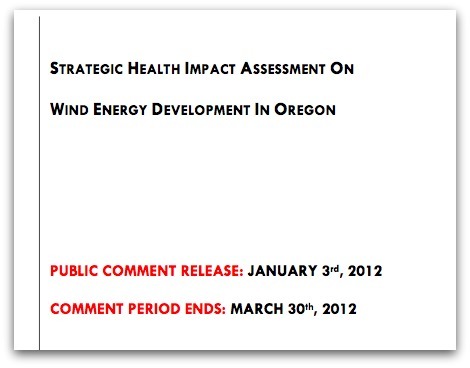 Editor’s note: Want to read the State of Oregon’s official view of wind turbine health impacts? Click here. Our appreciation to Steve Thurston, Maine, for alerting us to this document. This report is being released for public comment. This is an opportunity for anyone to review and comment on the document. These comments will be considered for the final version of this report. The Oregon Public Health Division will consider every comment received by the deadline. Because we anticipate a large volume of comments, we do not plan to respond individually to each comment submitted. Forewarned is forearmed. Please take note of the recent health problems from wind turbines too close to residences in Falmouth, MA. and be duly informed. The Falmouth example will occur anywhere commercial/industrial wind plants are sited closer than a 1.25 mile setback to a lived-in home. Note: Consult a reliable sound engineer on turbine noise and ultra sound effects. I recommend Rick James or Robert Rand.